Blessed Charles de Foucauld, C.
St Lucius of Chur, K. & Bp. St Birinus of Wessex, Bp. St Ambrose of Milan, Bp. St Finnian of Clonard, Bp. St John of the Cross, C.
O Adonai. St Flannan, Bp. O Clavis David. St Ursicianus of St Ursanne, H.
St John, Ap & Ev. St Thomas a Becket, Bp. Ss Basil the Great & Gregory Nazianzen, Bps. Holy Name of Jesus, St Genevieve, V.
St Aelred of Rievaulx, Ab., St Benet Biscop, Ab. St Hilary of Poitiers, Bp. Sts Maurus & Placidus, St Ita, V.
Ss Fabian & Sebastian, Bp. & M.
St Meinrad, M., St Agnes, V.M. St Francis De Sales, Bp. St Blath of Kildare, V.
St Eusebius of St Gall, Ab. St Brigid of Kildare, Ab. St Gilbert of Sempringham, C.
Ss Indract and Dominica of Glastonbury, M.M., St Agatha, V.M. St Mel of Ardagh, Bp. St Richard of Wessex, K.
Our Lady of Lourdes, St Caedmon, C.
St Finan of Iona, Bp. St Colman of Lindisfarne, Ab., St Bernadette, V.
St Mildred of Thanet, Ab. St Ethelbert of Kent, K.
St Oswald of Worcester, Bp. St David of Wales, Bp. St Ciaran of Saigher, Bp. Sts Felicity and Perpetua, M.M. St Senan of Scattery, Ab. St Frances of Rome, Ob. St Attalas of Bobbio, Ab. St Aengus the Culdee, Ab. 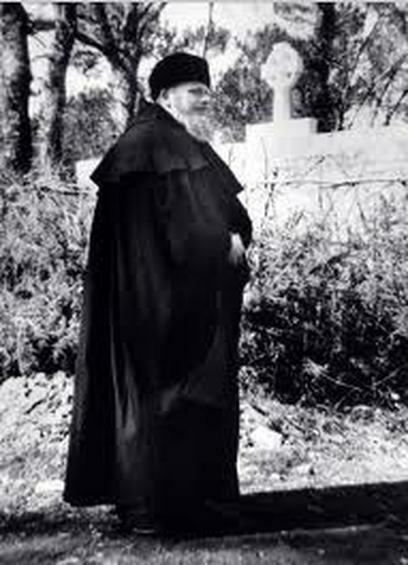 St Aristobulus of Britain, Bp. St Frigidian of Lucca, Bp., St Jacques de Molay, M.
St Cuthbert of Lindisfarne, Bp. Passing of OHF St Benedict, St Enda of Aran, Ab. St Macartan of Clogher, Bp. 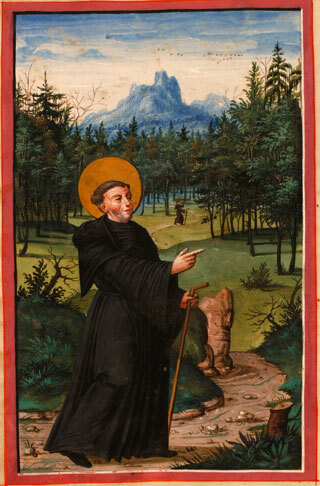 St Rupert of Salzberg, Bp. St Tighernach of Clogher, Bp. St Ethelburga of Lyminge, Ab. Bl. Notker of St Gall, C.
St Jean Baptiste de la Salle, C.
St Guthlac of Croyland, H., St Gemma Galgani, V.
Interior Life of the BVM, St Teresa of Jesus of the Andes, V.
St Laserian of Leighlan, Ab. St Alphage of Canterbury, Bp. M.
St George the Great, M.
St Fidelis of Sigmaringen, M.
St Rafael Arnaiz Baron, C.
St Louis Marie de Montfort, C.
St Endellion of Cornwall, V.
St Ultan of Perrone, Ab. Bp. St Philip & St James, Aps. St John of Beverley, Bp. St Cathal (Cattaldo) of Taranto, Bp., Blessed Julian of Norwich, V.
St Comgall of Bangor, Ab. St Mael of Bardsey, C.
St Dymphna, V.M., St Carthach the Younger, H.
St Brendan the Voyager, Bp., St Simon Stock, C.
St Madern of Cornwall, C., St Pascal Baylon, C.
St Dunstan of Canterbury, Bp. Blessed Alcuin of York, C., St Bernardine of Siena, C.
St Godric of Finchale, C.
St Augustine of Canterbury, Bp., St Melangell, V.
St Joan of Arc, V.
St Kevin of Glendalough, Ab. St. Norbert, Ab., St Jarlath of Tuam, Bp. St Colman of Dromore, Bp. St Ternan of Culross, Bp. St Anthony of Padua, C.
St Richard of Chichester, Bp., St Lutgarde, V.
St Moling, Bp., Blessed Marie-Joseph Cassant OCSO, C.
Translation of St Edward, K. M.
St Etheldreda of Ely, Ab. St Moluag of Lismore, Ab..
St Irenaeus of Lyons, Bp., Blessed Paul Giustiniani, C.
St Peter and St Paul, Aps. St John of San Francisco, Bp. St Kilian, Colman and Tadhg, M.M. St Sigisbert, Ab. and St Placidus, M.
St Henry, Patron of Benedictine Oblates, K.
St Bridget of Sweden, Ab. St Declan of Ardmore, Ab. St Samson of Dol, Bp. St Pellgrino, H., St Alphonsus, C.
St Peter Julian Eymard, C.
St Oswald of Northumbria, K. M.
St Tugdual II, Bp., St Clare, V.
St Muredach of Killala, Bp. St Bernard of Clairvaux, Ab. Blessed Maria Franciszka Kozlowska, V. , St Eugene of Derry, Bp. St Louis of France, K.
Blessed Dominic of the Mother of God, C.
St Aidan of Lindisfarne, Ab. St Gregory the Great, Bp. St Ciaran of Clonmacnoise, Ab. St Finian of Moville, Ab. Holy Name of Mary, St Ailbhe of Emly, Bp. Exaltation of the Holy Cross, Blessed Maria Celeste Crostarosa, V.
St Nicholas of Flüe, C.
St Marcellus of St Gall, C., St Vincent De Paul, C.
St Therese of the Child Jesus, V.
St Francis of Assisi, C.
St Faustina Kowalska, V., St Placid & Comp. M.M. Our Lady of the Rosary, Ss. Bacchus & Sergius, M.M. St Paulinus of York, Bp. St Canice, Ab., St Alessandro Sauli, Bp. Trans. St Edward the Confessor, K., St Daniel & Comp. St Teresa of Avila, V.
St Gall, Ab., St Margaret Mary, V.
St Ignatius of Antioch, Bp. M.
St Paul of the Cross, C., St Philip Howard, M.
St Donatus of Fiesole, Bp. St John Houghton & Companions, M.M. St Odhran of Iona, Ab. Ss Simon & Jude, Ap. St Colman of Kilmacduagh, Bp. All Soul’s Day, St Gregorios of Parumala, Bp. St Leo the Great, Bp. St Martin of Tours, Bp. St Gertrude, Ab., St Margaret of Scotland, Q., St Otmar, Ab. St Edmund of East Anglia, K.M. St Colman of Cloyne, Bp. St Katharine of Alexandria, V.M. Our Lady of the Miraculous Medal, St Fergal of Salzburg, Bp. St Brendan of Birr, Ab. Generally the dates of feast days follow the current Roman Catholic usage, however, occasionally the alternative dates observed by Orthodox or Anglicans have been substituted to avoid duplication of observances on any one day. Solemnities and major feast days for the HCC have been printed in the relevant liturgical colour (Red Letter Days), whilst white letter days may be observed as lesser Feasts, Memorias or Commemorations as may be desired by the individual or community.